This month we met the spring season with our April Green Tease events in Glasgow and Edinburgh, welcoming a range of people from across the arts and different areas of sustainability to find points of connection between their interests and practices. 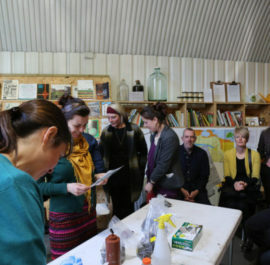 Our Glasgow event took place in the temporary lab of the Soil City project, run by artists and food activists, Open Jar Collective. Initiated during Glasgow International Visual Arts Festival, Soil City is intended as a long term research project, bringing together different communities to ‘reimagine the city as if soil matters’. In an introductory tour around the lab we were shown the multi-layered map of green and brownfield sites visited during the three weeks of GI, and soil and plant samples taken from around the city. Alex Wilde, member of Open Jar Collective, explained their motivation for exploring the state of soil in the city, as an under-appreciated resource but something which we are all rely upon and are intrinsically connected to. She described the layered nature of Soil City programme encompassing site visits, soil testing (contributing to OPAL citizen science project), walking and bike tours, public talks and workshops, and an online archive Field Notes, designed to capture the range of perspectives and ways of thinking about soil which emerged over the three weeks. In between homemade soup, cakes, cups of tea and some hands on soil testing, the Green Tease gathering held a passionate discussion soil. It seemed that everybody has a story to tell or question to ask about how we understand, use and look after the soil in our neighbourhoods and city. See Katy Gordon’s account of the discussion here. We also spoke about what Open Jar saw their roles as artists to be in raising questions about urban relationships with soil. 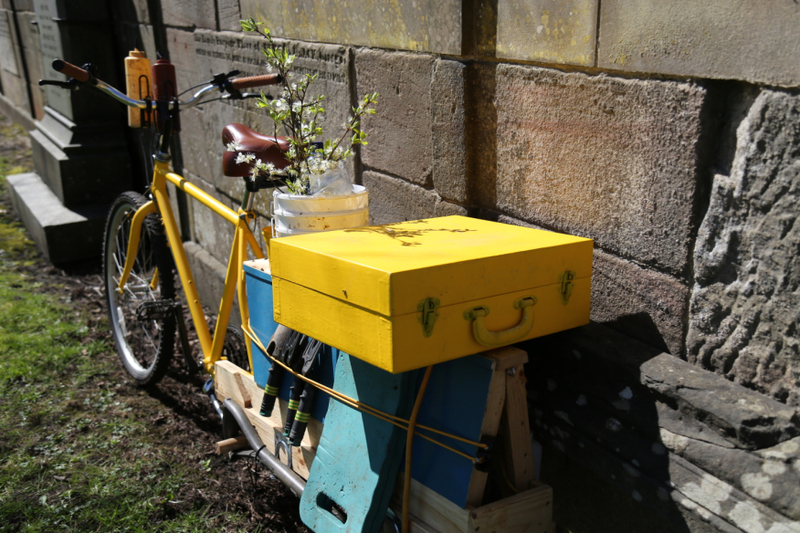 Clem Sandison suggested that the bespoke bright yellow bicycles, designed and made by the collective, were symbolic of their artistic approach, offering an usual and intriguing starting point for conversation, that you may not come across in a typical citizen science project. She also talked about the importance of creating new civic spaces for discussion, bringing together diverse perspectives and encouraging learning, exemplified through the Soil City lab. Over the course of the event we discussed the importance of finding new ways of valuing soil, as well as green spaces and brownfield sites in cities, beyond their potential for economic development. It became clear that Open Jar Collective see part of their role as offering a different set of values based on the connections between communities and urban ecologies. We look forward to seeing how the Soil City project unfolds over the coming months! 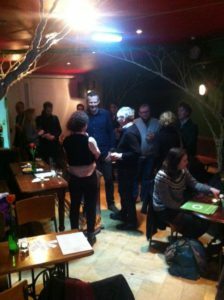 Our Edinburgh Green Tease for April took place in the back room of Woodland Creatures on Leith Walk on Tuesday 26th. A ‘Green Tease Get Together’, the event was very informal, with lots of ideas exchange, connections, and spirited discussion. We used question cards on tables to prompt wide ranging conversations: on everything from the last time someone asked attendees about sustainability, to what they need to achieve their own arts and sustainability ambitions! With attendees from across the arts and sustainability spectrum, and lots of new faces, it was great to get to know all our green-teasers over these drink and nibbles! Our next Green Tease will take place on Monday 23rd May with artists Jo Hodges and Robbie Coleman. Find out more and sign up here.